I have not heard a fully satisfying performance of Brahms’s Third Symphony live, and Saturday night’s at the Shed was not destined to be the first one. The BSO Director of Program Publications Mark Mandel’s program notes emphasize the difficulty of the piece for conductors, and I have no reason to doubt him (is it really true some won’t play it because all the movements end quietly?). The first movement moved rapidly but refused to catch fire, and the first time through the exposition the winds were tentative. The second time through things loosened up, and some encouraging signs appeared. The balance was excellent; I realized just how hard the winds had had to work the night before, now that they projected effortlessly. The coda of the first movement suddenly brightened and there was a sense of urgency that hadn’t been there before. The second movement was pretty but prosaic; but again, near the end there was a striking moment where a falling-rising-falling figure in the strings slides down and in an instant the emotion ratcheted up and Brahms suddenly anticipated Mahler. In fact, on this occasion Nelsons seemed to be an expert at endings, as the finale was excellent throughout. Each episode had its own color and its own weight—slashing strings felt lifted above the surface, while the winds felt pulled down to earth. This was my first time seeing the man conduct; he has some quirks: a tendency to grab the rail of the podium and lean back on it, a curious posture that looks both casual and stylish; moments where he holds the baton with the handle facing out; a gesture with both hands that to me suggested jellyfish; and a willingness to crouch down to an almost absurd level to suggest quiet. Edward Gardner, who conducted the night before, could not have provided a greater contrast, with his almost military bearing and essentially vertical approach to the podium. Nelsons seems unusually comfortable on the podium, making it his personal space as well as a public one. He can be quite busy at times, although during much of the first movement of the Brahms he was content to give quite large beats, and he merely shaped much of the opening of the second. On quite a different note, does anyone else think he bears a strong resemblance to Seth MacFarlane? 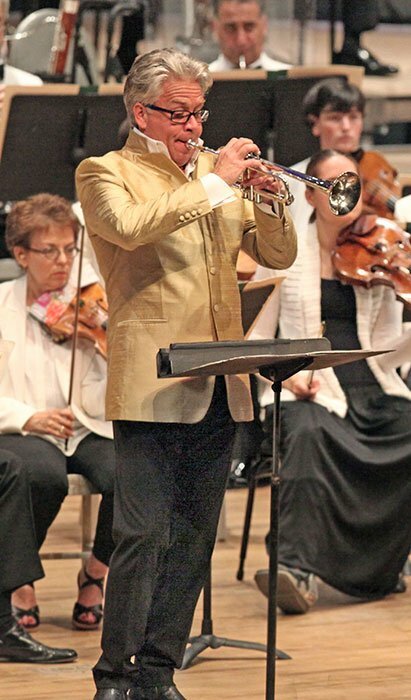 The second half featured Swedish composer Rolf Martinsson’s Trumpet Concerto No. 1, “Bridge,”with trumpeter Håkan Hardenberger, who has played it upwards of fifty times—several with Andris Nelsons. The subtitle is a fanciful evocation of the piece’s structure – three movements, fast-slow-fast, joined by two “bridges” of cadenzas. The orchestra for the Concerto is gigantic—extra strings, piano, celeste, two harps, and an awful lot of winds and percussion. Martinsson is not one of these fastidious composers who fills the stage with instruments only to use them in subsets; he is quite happy to have everyone playing along all at once, and clearly has a lot of skill making that kind of music work. The concerto is big, splashy and busy, filled with vivid (even garish) colors that can’t help evoking the movies. It has some similarities with Magnus Lindberg’s Clarinet Concerto, a later composition by a Scandinavian composer for huge orchestra and preternaturally gifted soloist that trades in massive gestures and pushes the solo instrument to its limits. “Bridge” is constantly engaging, but passes by without leaving much of a mark. There’s a particularly noir-ish melody in the first movement that sticks in memory, and a brooding line in second movement that touched an emotion. However, the finale is undeniably infectious, an essay in musical tachycardia that starts quietly but ominously with rapid snare drum beats and grows in size and ferocity, never letting up. Hardenberger’s performance was as much a feat of strength, daring and endurance as a musical one; the orchestra is put through similarly challenging paces. It sounds fearsomely difficult, but also as though it must be a lot of fun to play. I was caught up in it despite myself. The evening ended with Tchaikovsky’s Capriccio Italien. While I certainly hope Nelsons’ tenure with Boston will be successful and that the success will found in music like Brahms, it does seem that in this more decorative repertoire he is already there. The orchestra sounded glorious—the brass alternately crisp and sunny and hooded and threatening; the winds a clear, well-voiced choir; the strings buttery in the schmaltzy melodies, and powerful in the climaxes. Nelsons’ second Tanglewood weekend showed the orchestra and the conductor still getting to know one another—with some very real promise, but they’ve already figured out how to make the crowd go home happy.